Mexican trade negotiators are pushing to finish work on an updated free-trade agreement with the European Union ahead of a trip by President Enrique Pena Nieto to the region later this month, according to three people familiar with the plan. Mexico started work on updating its pact with the EU in mid-2016 and had aimed to complete a deal by the end of last year. The goal is now to finish negotiations in time for Pena Nieto to announce the agreement on a trip to Germany during the last week of April for Hannover Messe, an industry show where Mexico is the chosen partner country this year, according to the people, who asked not to be named discussing private negotiations. While talks to update the North American Free Trade Agreement have received more public attention, many of Mexico’s same negotiators within the Economy Ministry have been working to update the 17-year-old agreement with the EU, the biggest buyer of Mexican goods after the U.S. and Canada. Some Mexican negotiators plan to go from Washington to Brussels next week even as Nafta talks continue in order to try to land an EU deal before Pena Nieto’s arrival, and Minister Ildefonso Guajardo will also travel there after a summit this week in Peru, according to the people. Deepening ties with the EU is part of Mexico’s push to diversify exports. Seventy-two percent of the nation’s $435 billion in annual goods sold abroad go to the U.S. The nation is also working to make inroads with China, Brazil, Argentina and the 10 nations in the Comprehensive and Progressive Agreement for Trans-Pacific Partnership, known as the CPTPP. Cars, auto parts and oil represent the top products traded between Mexico and the EU, according to data from Mexico’s Economy Ministry. „It’s a priority for Mexico to move forward and finalize the trade agreements we have with the European Union, Asia-Pacific nations with the CPTPP, and at the same time have good results with Nafta,“ the press office of Mexico’s Economy Ministry said in an e-mailed statement. The U.S. bought almost three quarters of Mexico’s $435 billion of exports in 2017. Since the EU deal went into force in 2000, Mexico’s exports to the region have more than quintupled to $27 billion annually, according to data from the International Monetary Fund. 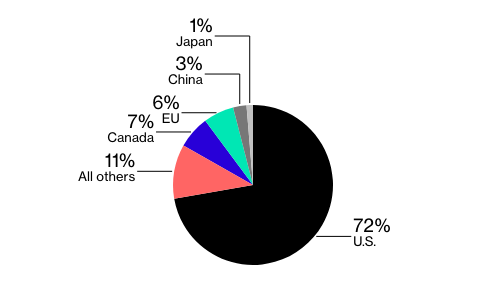 The almost matches Canada’s $29 billion in annual purchases. As with Nafta, the requirements for content regarding cars that are traded between Mexico and the EU and how much content needs to come from the two partners is proving to be one of the toughest issues, said Francisco de Rosenzweig, a lawyer at White & Case who previously served as Mexico’s top international trade negotiator and led the start of talks to update the EU deal. Geographic labels for European products including wine and cheese and expanding market access for Mexican meat exporters are among the final issues to resolve, Rosenzweig said. Companies based in the EU have accounted for 36 percent of foreign direct investment in Mexico over the past two decades, focused around manufacturing, financial services and construction. That compares with about 6 percent for Canada, according to Mexico’s Economy Ministry. Spain alone accounted for 12 percent, with the Netherlands making up 11 percent of total FDI, making them the biggest investors in Mexico after the U.S.